In honour of our second birthday, we’re teaming up with our promotions pals Vincent & Jules to co-captain a raging, live-music-fuelled night of festivities on 22 July at The Zoo. Kick starting the shenanigans with tunes smoother than Jack Sparrow swindling a bottle of rum, is Brisbane’s newest rock outfit Rude Rum. Down a glass or two while listening to this musical Kool Aid and you’ll be on the path to party nirvana. Chief Weapons will also be helping blow out the candles, injecting punters with their infectious blend of alternative-rock. Like a fever you can’t sweat out, you’ll find yourself immersed in a simultaneous head-banging and dancing trance you won’t want out of when local champs Cheyne Starkie & The Cosmic Glow unleash their cosmic grooves. Taking the cake (and most likely to throw some too) as headline act is boisterous, dynamic duo ROO. 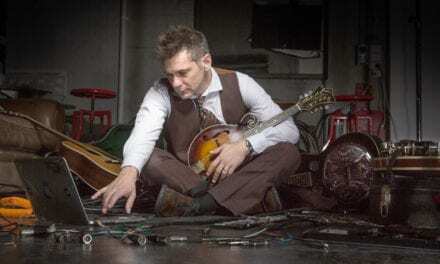 Fresh from the studio, these legends will be launching their new EP Bansidhe in true ROO form – soulful vocals, grungy guitar and two crazed musicians who love to get down and dirty. This ain’t a scene it’s a goddamn ROO party! 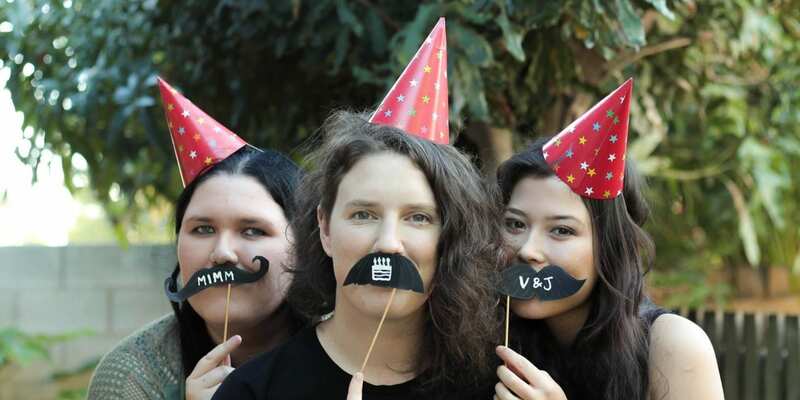 “We’re thrilled to be playing at the 2nd Birthday Bash for Vincent & Jules and Music Is My Muse at The Zoo! Two Brisbane businesses and a venue – all headed by strong, hard-working and passionate women. 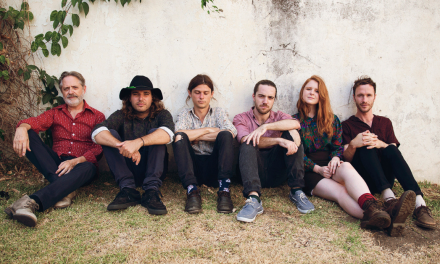 It’s an honour,” said ROO frontwoman Roo. After two years of reppin’ local music through press, parties and musical ponderings we’re kicking our heels up and raising our alcoholic beverages to the local music scene we love! The only question is, will YOU be joining us? So, grab your mates, grab a random Tinder date and anyone else you love or hate, and get your arse to Brisbane’s hottest we’re-not-at-SITG piss up (for just FIVE BUCKAROOS)!!! 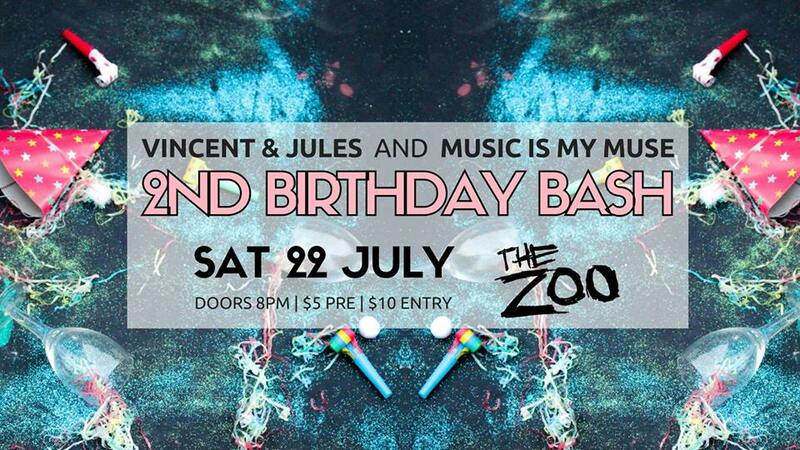 Music Is My Muse and Vincent & Jules 2ND Birthday Bash Bonanza invades The Zoo on Saturday, 22 July. Purchase your ~~FIVE DOLLAR~~ PRE-SALE TICKETS directly from the organisers and bands*. Door tickets $10. Join the Facebook event HERE. *All PRE-SALE tickets receive a gift bag of goodies upon arrival, including a copy of ROO’s new EP Bansidhe. This is an exclusive offer for PRE-SALE tickets ONLY! Mates rates baby! 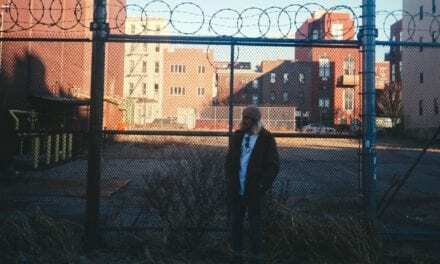 **Want to hook-up pre-sale tickets but don’t know anyone in the know? Shoot a message to info@musicismymuse.com.au and we’ll arrange ticket pick up from our Fortitude Valley office.